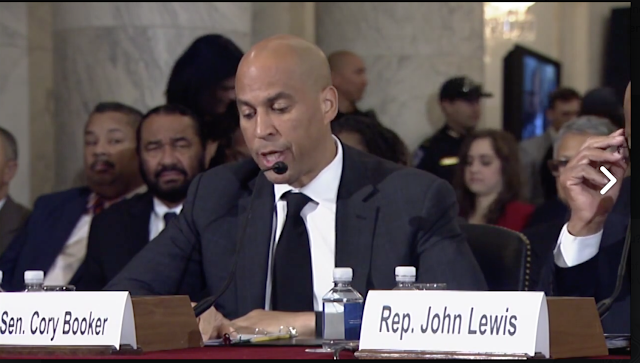 Progressive Chat: Against Precedent, Sen. Booker, and Congressmen Lewis testify against Jeff Sessions. Trumps AG nominee. Against Precedent, Sen. Booker, and Congressmen Lewis testify against Jeff Sessions. Trumps AG nominee. The Congress is a enshrined with norms and traditions. It prides itself on its traditions and collegiality (even in these uncivil times). One of which is Senators do not testify against others senators who have been nominated to a cabinet position.Today, bucking that Precedent, Senator. Corey Booker (D - NJ) joined Congressmen and and civil rights living icon Congressmen. John Lewis testify against Jeff Sessions, Trump's Attorney General nominee. They weren't the only ones ignoring norms though. Sen. Cory Booker had to take some of his valuable allotted testimony time to officially recognize the fact that there were numerous members of the House of Representatives (all Congressional Black Caucus members) sitting in the gallery behind him during his testimony because Senate Judiciary Chairman Grassley (R-IA) failed to do so. Committee chairman Grassley failed to recognize a single member of the other body in the hearing room, let alone well over ten of them, is a significant breach of protocol. Grassley has been in the Senate for damn near 100 years, so he knew exactly what he was doing. It's not like he didn't notice 10-15 black people sitting behind Booker. In addition to this flagrant insult to numerous colleagues, Grassley had civil rights icon, Rep. John Lewis and the chairman of the Black Caucus not only wait to the very end of the hearing to testify, they had to alternate testimony with the three black former black colleagues of Sessions as though they were at the same level of members of the House and Senate. This is also very unusual, if not unprecedented. Members who wish to testify are almost always allowed to testify early in the process so they can get back to their duties. Making these fellow members wait and then not having the decency to recognize the presence of others was blatant disrespect, especially when the subject of the testimony was the racist history of the nominee. It was sadly the equivalent of putting them on the back of the bus. We will leave you with the poignant testimony of both Booker and Lewis.